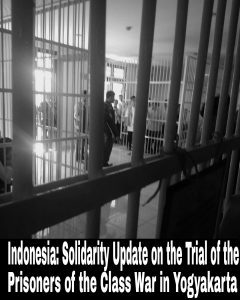 26.07.18: The trial has begun for the 4 anarchist prisoners of war who were transferred to Cebongan Prison for the Yogyakarta M1 (May Day) case. The state repression against the anarchist M1 actions is entering a new phase as the preliminary trial hearing begins. The 4 anarchist prisoners of war who took part in the demonstrations at the intersection outside UIN Yogyakarta (Sunan Kalijaga State Islamic University) faced a preliminary trial hearing at the Sleman District Court on July 26th. The first preliminary trial hearing consisted of the prosecutor reading the indictment against the comrades. The prosecutor stated that this trial should take place separately from the criminal case and called for a split hearing. The trial is taking place in sequential order. Azhar and Zikra are Case Number 306/Pd.B/2018/PNSmn, while Edo and Boim are Case Number 305/Pid.B/2018/PNSmn. So it is a split case file, however the trial will still take place in the same court room. A split hearing was called for because the defendants are each facing different indictments from ongoing trials. In the indictment that was read out there is evidence presented relating to violence and destruction against public facilities. This is in accordance with evidence already gathered by the police and the prosecution. This entry was posted on Saturday, July 28th, 2018 at 6:41 pm	and is filed under Prison Struggle.